We are holding events in Appledore, Ashford, Canterbury, Dartford, Deal, Dover, Gravesend, Great Chart, Herne Bay, Isle of Sheppey, Lydd, Maidstone, Margate, Ramsgate, Sevenoaks, Tenterden, Tonbridge and Westgate on Sea. Please see below for a timetable of all the events. Saturday 24 February 2018 11am-3pm New 2 Guided walks: 12 noon and 1pm – meet at The Maritime Museum. Sign up today to participate in one of the guided walks. Alternatively you are welcome to come along on the day and participate in a self guided trail. When you participate you will discover more about your town in the First World War and find out where those who fought lived, went to school and worked. Using our self guided trail leaflets explore your neighbourhood to locate the shops where people registered their ration books, the pubs they used or the cinemas they went to. The trails are self guided, with some locations arranging a guided trail as shown above, and a central point where you can collect a trail map to guide yourself. 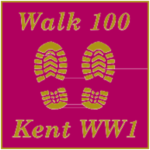 On each of the trails we are going to ask people to take a selfie to prove they have done the walk and also a selfie at the venue with our rather lovely poppies.. We are hoping to encourage people to tag their photographs and upload them to twitter as a Kent wide wall publicising the community resource the trails provide across Kent. Everyone who walks the trails and takes photos will be entitled to a Walk 100 pin. Our very ambitious aim is to have 100 people in each location walk their local trail over the week end.